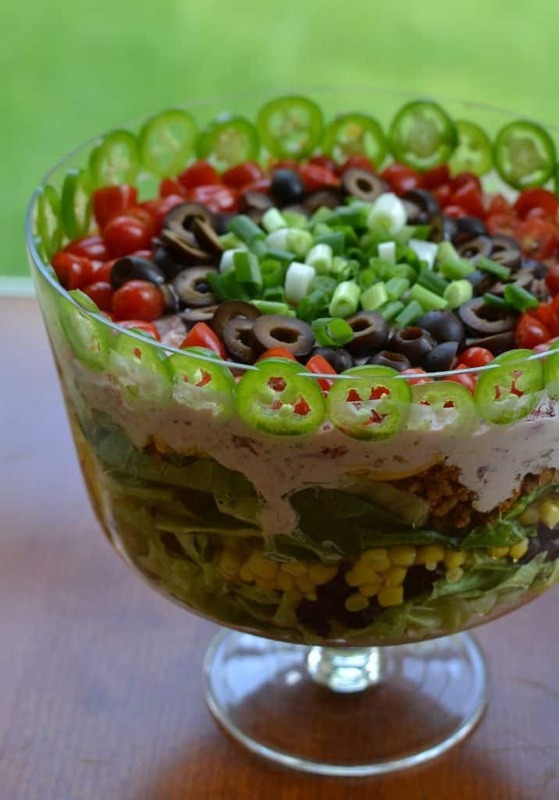 Layered Taco Salad is a gorgeous layered salad of romaine, black beans, corn, seasoned beef, cheddar cheese, tomatoes, black olives, green onions and jalapenos with a simple sour cream and salsa dressing. 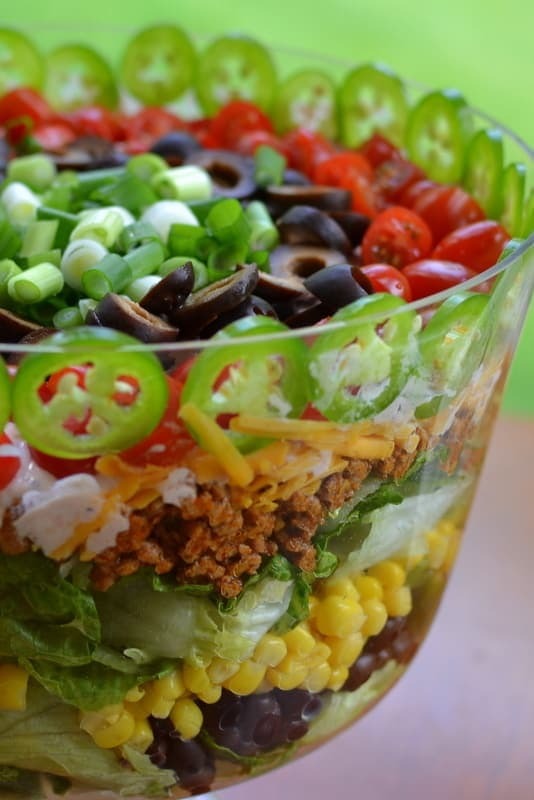 This Layered Taco Salad is as beautiful as it is delicious! You can serve it for a luncheon or a Saturday night dinner complete with spicy Bloody Marys. You can use ground beef or ground turkey. I use ground turkey just because it is a little leaner. You can substitute different items if you really dislike something. A lot of people don’t like black olives. For goodness sake sub some avocado. Just remember chunks of avocado will turn brown if you don’t brush them with lemon juice. The flavors in this delectable Layered Taco Salad meld together like a fine tuned instrument. Rarely something so pretty tastes so darn good. Now if you like you can add a little ranch dressing but it really tastes better without it. A little salt & pepper and I am happy as a lark. 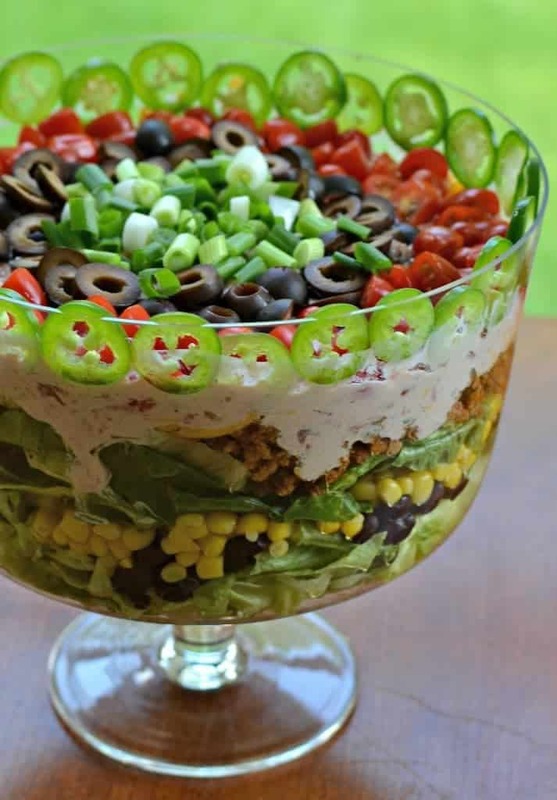 This beautiful Taco Layered Salad is fancy enough for company yet easy enough for you and family for a Sunday afternoon lunch. Do you like Tacos? We love taco anything and everything taco. 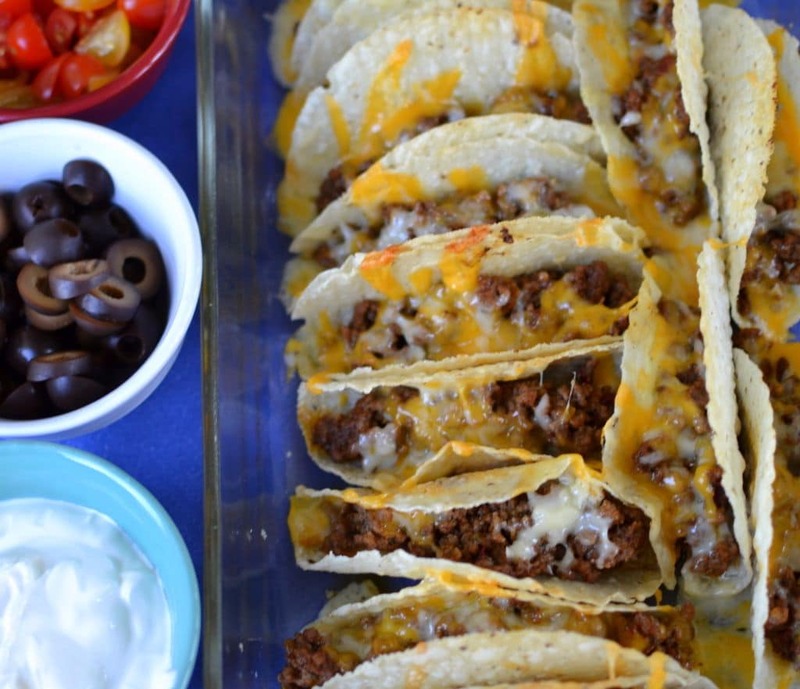 Here are some more great taco recipes! You can also toss some freshly made tortilla chips on the top but I like mine without because the flavors are so awesome that I don’t want to mask them. Happy cooking! This post was originally published April 30, 2016. New relevant information and new pictures were added and it was republished May 24, 2018. In skillet over medium heat brown ground beef (or turkey) drain fat. Add water and taco seasoning and simmer for 15 minutes. 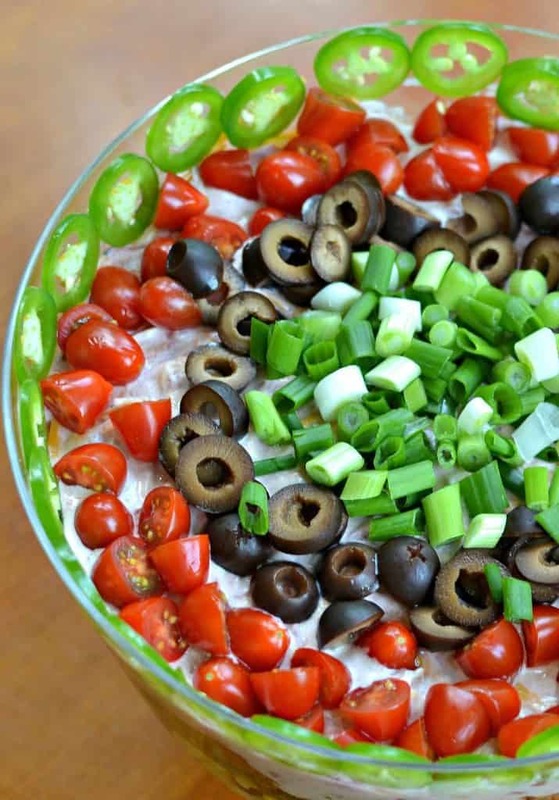 In small bowl combine sour cream and salsa. Set aside. Place 1/2 of lettuce in the trifle bowl. Top in order with black beans and corn. Add the rest of the lettuce. Top in order with taco meat and cheddar. Smooth over with the sour cream/salsa mixture. Add ring of tomatoes on the outside, followed by a ring of black olives. Add the green onions to the center and run the rim with jalapenos on their sides. If desired serve with ranch dressing on the side. Other delicious recipes you will love! This looks beautiful! I’m going to make it for a ladies luncheon I’m doing on Cinco DeMayo.You are my hero! All of your recipes that I’ve made I’d give 5 out of 5 stars. Thank you once again. This is such a gorgeous salad! It looks delicious! It would be a great summer party food. 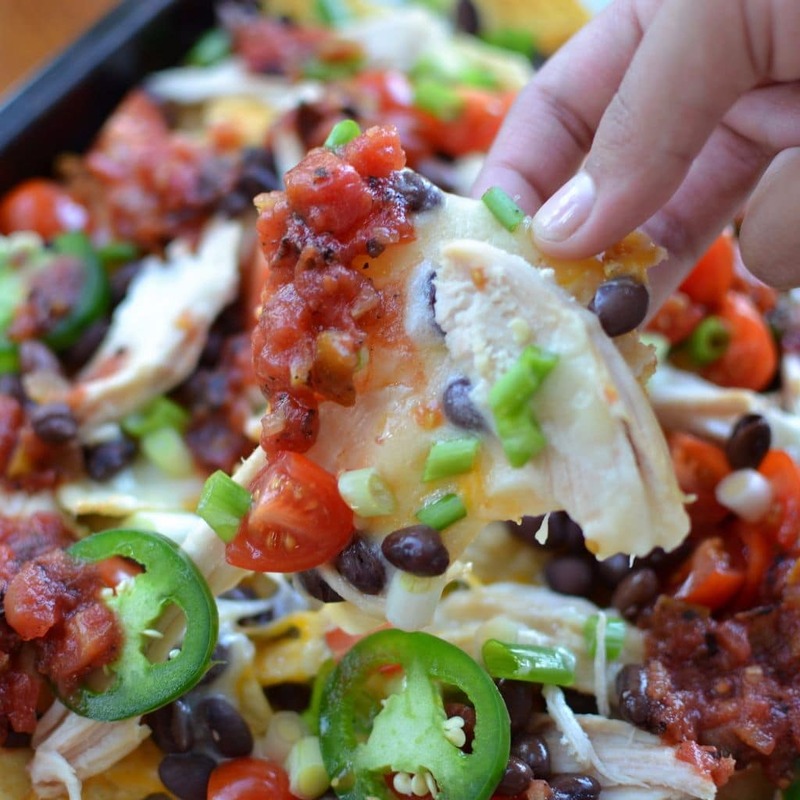 FYI…the Layered Taco Salad you made looks Divine! Thanks so much and I am glad that I reminded you about the black beans and corn. I love this salad. I am going to have to make it again soon!